Inspired by Native American clothing from a long time ago, this costume has a knee-length pullover dress that features fringed edges and a pattern print trim which decorates the collar and hemline. The ensemble is completed with a woven belt which ties around the waist and topped off when a matching headpiece. 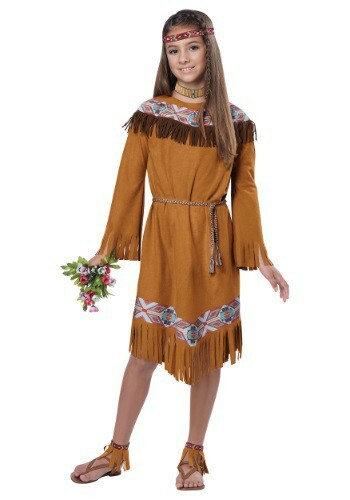 The long sleeves end in fringe, as does the bottom of the attached tunic skirt. So disappointed in this costume. Doesn't look half as nice as it does in the picture. The material is cheap and the dark brown fringe on the top was all wrinkly - it doensn't lie nice and flat as shown in the picture. The pattern on the bottom and at the neckline is stamped on. It was done so poorly that the costume I received had a big turquoise blotch on the front. The pattern at the bottom does not continue on the backof the dress.. The neckline literally looked as if someone took a scissor and hacked out a hole. It wasn't turned over and finished and my costume had a nick in the fabric at the neck.. The costume was so chintzy and cheap looking - I regret ordering it. I could have done a way better job myself. I'm so sorry to hear about this! Did you happen to reach out to Customer Service regarding the costume condition? They are always willing to help in situations like this one. Please don't hesitate to reach out with your order number and they will be happy to assist you. It fits great & it is good material. I'm glad that it looks just like the picture. My daughter loves it ! !